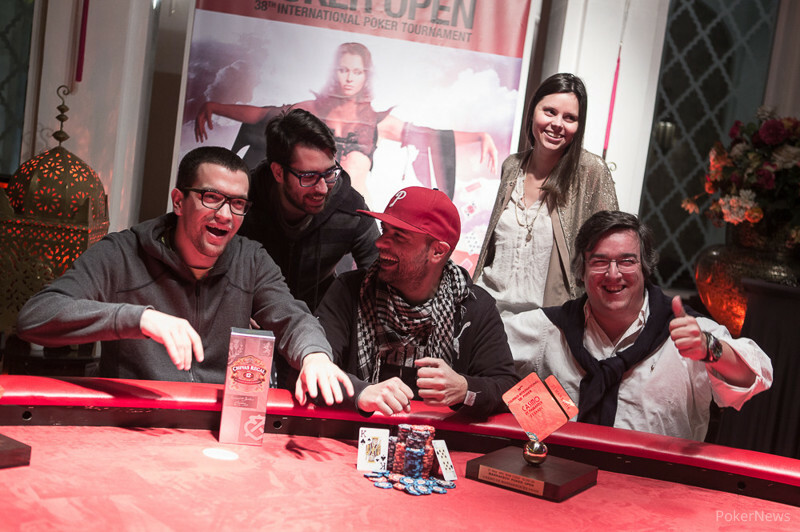 Portuguese Poker Pro Henrique Pinho Wins 2016 Marrakech Poker Open! Portuguese poker pro Henrique Pinho has done it, winning the 2016 Marrakech Poker Open Main Event to earn the largest live score of his career. 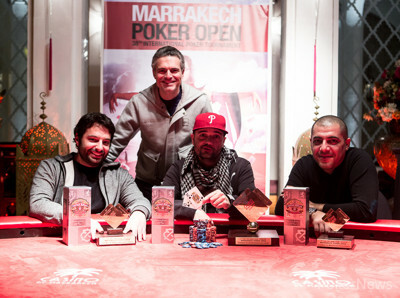 The third and final day of the event saw eight players from a 220-entry field return to Casino de Marrakech. It took eight hours to determine a winner, and ultimately that proved to be Pinho, who emerged victorious after a 90-minute heads-up battle with Patrick Groppi. Pinho earned 390,000 Dirhams (approx. $40,400 or €35,800) for the win. Michael van der Ghinst and Mathieu Biague started the day under pressure with less than 10 big blinds. Van der Ghinst doubled on the first hand, but Biague couldn't find the same fortune and bowed out in eighth place. He three-bet shoved with king-jack suited out of the small blind, and the initial raiser, start-of-the-day chip leader Abdenbi Abida, snap-called with ace-king and held. Despite the early double, van der Ghinst followed Biague out the door 10 minutes later. He defended his big blind in a three-way pot with pocket fours and check-raised all in after a ten-high flop with two sixes. Pinho flopped trips with ace-six and picked him off in seventh place. Ali Mechiche started the day as one of the bigger stacks, but quickly lost momentum before falling in sixth place. Mathieu Papineau was then bounced in fifth to leave the final four. Up until this point, everything was still going fine for Abida, but he soon fell to the bottom of the pack. Eventually, he clashed with Fahd in a pot where the two held premium hands — Abida had pocket kings and Fahd had ace-king. Unfortunately for Abida, an ace flopped and he was left with two big blinds following the completion of the board that gave him no help. He was gone on the next hand in fourth place. Another 90 minutes later, Fahd was sent to the rail in third place. The Moroccan, who already came second in the 2016 Marrakech Poker Open High Roller earlier this week, doubled up five times in total through Pinho at the final table, but eventually the fight with his short stack came to an end. Fahd shoved the button with ace-five, and Groppi re-jammed from one seat over with pocket tens. The tens held, and that was that for Fahd. Pinho started heads-up play with a solid lead of more than 3-1, but Groppi was not giving him an easy ride and doubled early on. Groppi doubled a second time and even took the lead for a few hands before both players agreed to a deal and left 30,000 Dirhams (approx. $3,100 or €2,750) to the winner. Ultimately, Pinho flopped an open-ended straight flush draw with king-ten suited and Groppi called his jam with aces on the final confrontation. Another spade appear on the turn to give Pinho a flush and the win. That marks the end of PokerNews' coverage here in Marrakech. Thanks for tuning in and hopefully we'll see you at the next stop on tour. The massive draw found help thanks to the turn and a blank river ended the tournament for Groppi in second place. Thanks to the deal, he takes home 350,000 Dirhams. Time for the winner pictures! Patrick Groppi scooped a two-barrel pot and then limped in to see Henrique Pinho make it 200,000 to go. The Frenchman called and his bet worth 225,000 on the flop won the pot. Pinho raised to 155,000 and Groppi called. On the flop, the Frenchman check-called a bet worth 75,000 before leading the turn for 130,000 himself. Pinho didn't go anywhere and made the call, facing another bet worth 250,000 on the river. The Portuguese eventually called and Groppi mucked. "Do you have the four?" Pinho shook his head and flashed . "Oh. Good call. 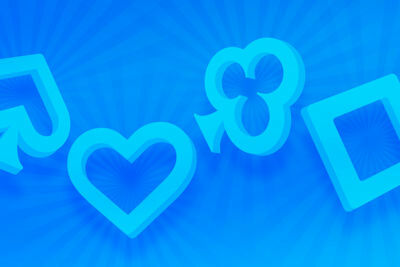 I tried to make you fold the four," Groppi added. Henrique Pinho raised to 130,000 and Patrick Groppi called to see the flop . Groppi check-called a bet worth 100,000 and the fell on the turn. Again Groppi checked and Pinho made it 350,000 to go. The Frenchman reluctantly called and the on the river saw him checking for a third time. Pinho bet 525,000 and Groppi then said "why so big on the turn? ", took another minute before calling. Pinho showed and the pair of aces scooped the pot. Henrique Pinho had pulled away some again before the deal was cut and a few minutes later, Fahd walked in to check what was happening. Patrick Groppi told him in French that a deal was done and that he was behind in chips. "But he is good. Really good," he said in French. Groppi then explained Pinho what he said and the Portuguese smiled "yeah, I understood." After the action had been somewhat stuck as of lately, Patrick Groppi asked Henrique Pinho whether or not to look at possible deal numbers. The clock was not paused, but Pinho gave it some thought. "Let me think about it for one minute." The Portuguese then suggested to take 360,000 Dirhams, Groppi having 350,000 Dirhams locked up and to play for another 30,000 Dirhams to the winner. Groppi agreed and they shook hands, play continues! Henrique Pinho raised to 135,000 and Patrick Groppi called to see a flop of . The Frenchman check-called a bet worth 150,000 before doing so again on the turn, worth 375,000. Groppi also checked the river and Pinho fired a third barrel worth 475,000. Groppi gave it some thought before announcing all in for more than 1.5 million in chips. Pinho checked his own stack without saying a word, didn't inquire about the shoving amount either, and folded. With three or even four players left, Henrique Pinho and Patrick Groppi had been very talkative, but this has definitely changed. The raising chips are thrown in without many words, barely any table talk except for a few remarks in between hands. Groppi raised to 125,000 and was called to see a flop of . Pinho check-called a bet of 105,000 and the turn saw no bets. On the river, Pinho bet 250,000 and that won the pot. Then, the Portuguese raised to 155,000 and Groppi three-bet to 325,000. Pinho called, but gave up the flop to a bet worth 260,000 by his opponent.